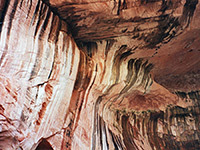 In the little visited northwest corner of Zion National Park, several branches of Taylor and La Verkin Creeks have carved narrow canyons in the Navajo sandstone rocks of the Upper Kolob Plateau, known collectively as the Finger Canyons of the Kolob. They are all quite spectacular, usually with year-round streams supporting lush green vegetation and plentiful wildlife. 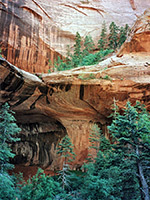 One popular hike is along the Middle Fork of Taylor Creek, a small drainage flowing through a deep V-shaped canyon that eventually becomes sheer-sided and narrow, with several unusual features such as Double Arch Alcove - a large cavity eroded into the rock walls with multicolored patterns formed by seeping water, and a curious waterfall that flows through a narrow curved slit in the rocks. The trailhead is just 2 miles from Interstate 15 (exit 40) along the paved Kolob Canyons Road, at a sign-posted parking area with trail information. 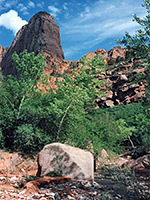 The road continues a few miles, following Taylor Creek upstream for a while before ending at an observation point with grand panoramic views of the Kolob Canyons area. 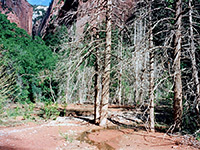 No special permit is required, just a standard Zion National Park entry fee. TopoQuest topographic map of Middle Fork of Taylor Creek. 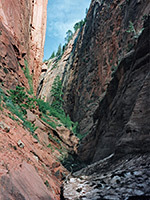 The trail descends quite steeply, close to the course of the South Fork of Taylor Creek and soon reaches the main stream. Here, the canyon is deep but wide and V-shaped, with red rocks and sandy soils, quite densely covered by trees, bushes and cacti. The path follows the valley upstream, at first on the south side but later on either side as it crosses the creek several times - the water is fast flowing but shallow and easily forded. 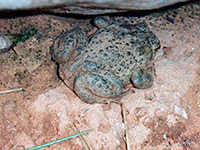 There is much wildlife, such as lizards, squirrels, chipmunks, deer, toads, grasshoppers and other insects. In spring the canyon is very colorful due to many delicate wildflowers and especially the large yellow or pink blooms of opuntia cacti. 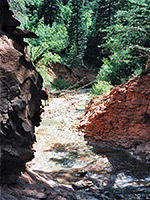 The canyon becomes gradually narrower with steeper sides, and the trees and bushes enclosing the stream grow taller and closer together. There are several features of interest like twisted rock strata, narrow water chutes and short cascades. The path also passes two small log houses built by settlers early this century, both with remains of some original furniture; one (the Larsen Cabin) is near the start of the hike, set back in the pine woods while the other (the Fife Cabin) is a mile further, close to the stream. 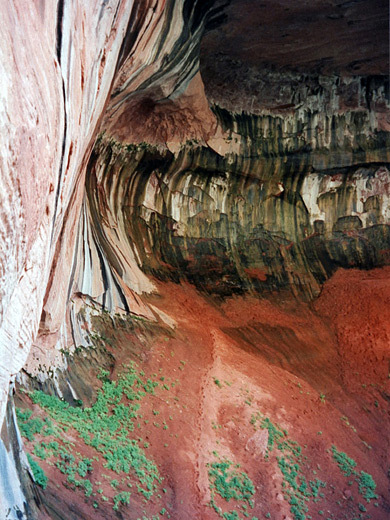 For most people, the hike destination is Double Arch Alcove after 2.5 miles, where a huge cavity in the cliffs has formed outside of a bend in the creek - the overhanging red and white Navajo sandstone rock is extravagantly streaked by water seeping through the sedimentary layers, and shelters many wildflowers, resulting in a colorful and unusual spectacle. The alcove marks the end of the official path, but continuing upstream presents no immediate difficulty. Around a wide bend, the canyon becomes steeper, rockier and less overgrown. After 10 minutes more the creek emerges from a narrow cleft in the rocks; above is a 30 foot waterfall - most pretty, with nicely curved rocks, unusual colors and rainbow-like light effects. 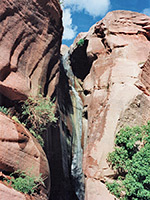 There is a rough, steep path at to the right (south) side of the falls leading to a flatish, wide, boulder-strewn area above. This extends for a few hundred yards, then the trees reappear and the cliffs, now nearly vertical, close in sharply. 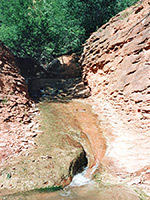 The canyon soon narrows, becoming just a few yards wide, as the stream forms pools, deep channels and waterfalls. Snow and other winter debris remains in this sheltered part of the canyon well into June, often to depths of many feet even while the stream continues to flow through tunnels underneath, so proceeding further may be impossible until late summer, though an impassable fall soon puts an end to all progress.